Danie Krügel the inventor of the 'quantum sniffer machine' is back to the UK news, Daily Star of the Express group [the media group that had to pay for out-of-court libel settlements twice to the McCanns and their Tapas friends] bring us a rehash of old news that were published in 2007 (Daily Mirror) and 2008 (Saturday Star) with far more detail and information. South African Danie Krugel says it is just 500 yards from the holiday apartment in Praia da Luz, Portugal, from where Maddie disappeared. The area is a wasteland, full of building rubble, rocks and black, plastic bags. It is one of two “priority search” locations highlighted by the former detective – one close to the complex and one near the beach. Krugel – known as “The Locator” for his success in tracing missing people in South Africa – was called in by Kate and Gerry McCann two months after Maddie vanished. He used DNA tracking – helped by a strand of Madeleine’s hair given to him by Gerry – and GPS satellite to pinpoint the area. He has also highlighted an area where he spotted a muddy pink and white child’s blanket. I’m convinced they will find her. I will do whatever I can to help. That area needs to be properly searched. «Former South African police superintendent Danie Krugel is haunted by the muddy pink and white child's blanket he found at the site in Praia da Luz in Portugal where he believes the body of Madeleine McCann is hidden. 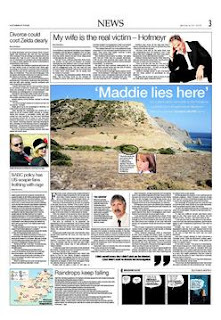 Now, due to his frustration at the lack of progress in the case, the ex-cop - dubbed "The Locator" as a result of his high rate of success in tracing missing people in SA - has broken his silence about the results of his search for Madeleine last year and revealed a map of the area where he believes she is buried. With the consent of her parents, Gerry and Kate McCann, Krugel spent three nights searching for missing Madeleine (4) in July, using the Matter Oriented System (MOS) equipment he has developed. 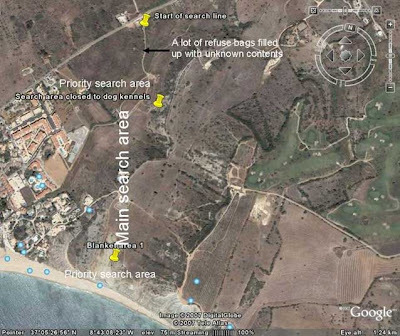 The site he outlined to be searched for Madeleine's body is a wasteland, full of black refuse bags, building rubble and rocks, and is located only 900m away from the Ocean Club resort apartment where the McCann family were staying in Praia da Luz. Krugel said sniffer dogs and a full forensic team should have searched the area, but this had not happened. "I kick myself every day that I didn't pick up the blanket. I just didn't want to disturb the investigation. The blanket was full of mud and had a light white, light-pink colour, and it was definitely a child's blanket. It was also clear that it had been in the elements for a while. I showed the police the blanket but I don't know if they picked it up," he added. Taking a hair from Madeleine's coat, which was given to him by her father, Krugel's equipment repeatedly gave him signals that led him to the site, which is within walking distance of the apartment. Madeleine is alleged to have been kidnapped while her parents dined at a nearby tapas bar. Krugel said he gave a copy of the map to Madeleine's parents and to the Portuguese police at the time, but refused to disclose details of his findings to the press for fear of anyone trying to disturb the scene. Now he wants to return to Praia da Luz to see if his equipment indicates that Madeleine's body is still there - or if it has been moved. Asked whether he would like Krugel to return to search for Madeleine, Gerry McCann said he had no say in the matter. "Kate and I have no control over who is allowed to go come and go into Portugal. "This is a matter for the Portuguese authorities. Officially I cannot comment further, sorry." After his search, Krugel requested the Portuguese police to use sniffer dogs and a forensic team to search the area. But when they were brought in a few weeks after he left Portugal, the sniffer dogs picked up a scent on Kate McCann and in the hired car, which changed the focus of the investigation, he claimed. Portuguese police have now named three suspects in the case: Gerry and Kate McCann and Praia da Luz resident Robert Murat. "After the sniffer dogs were brought in, I think the police altered their line of investigation, and I don't believe they searched the area I gave them. From the site 'Stop Danie Krügel': «Danie Krügel is a former South African police officer currently employed as Director of the Protection Services and Occupational Health & Safety at Bloemfontein’s Central University of Technology. Mr Krügel claims to have invented a novel technology called a “Matter Orientation System” (MOS) for locating missing items and people, and he has featured in numerous newspaper articles and investigative TV programmes in SA [South Africa] such as 3rd Degree and Carte Blanche where his claimed ability has been naïvely highlighted, usually in connection with missing persons cases. The disappearances of Madeleine McCann and, more recently, Kerry Winter are among the more prominent cases in which Mr Krügel’s help has been requested, but there are several others including that of 7-year-old Sheldean Human, policewoman Francis Rasuge and Anisha van Niekerk. Mr Krügel is very secretive about his alleged invention but insists that it is “science, science, science! … just science,” using quantum principles in conjunction with the global positioning satellite system (GPS). Briefly, he requires a small sample of the material whose source he is asked to locate – a cutting of hair in the case of a human – which he then uses to perform what he calls “measurements” from a few different positions before announcing the source’s current location within reasonable limits. Scientists overwhelmingly agree that there is no known mechanism that can account for Mr Krügel’s supposed technology working as he describes, and they are therefore eager to validate his claims to novelty. However, Mr Krügel appears overly reluctant to submit to any formal testing by an independent and trustworthy authority. His main concern seems to be that he will have to reveal his trade secrets, a concern that is invalid since such testing need not establish how it works, only that it does work. For people and families whose loved ones have disappeared, especially young children, Mr Krügel’s claims are a beacon of considerable hope and therein lies perhaps the most compelling reason for Mr Krügel to verify his claimed abilities. How much more ultimately cruel and ruinous is it to live in protracted false hope than to face a potentially devastating truth – a false hope that has been actively nurtured by uncritical media with a craving for perpetual sensationalism? Added to which, if Mr Krügel’s claims do not prove out, there exists a clear danger of significant amounts of wasted effort in pursuing false leads. Recently, Mr Krügel has also claimed that his device is able to detect cancer and other diseases in patients, a claim that is clearly dangerous if found to be untrue. * Why has Danie Krugel not published his findings for peer review by the scientific community? * Why does he keep appearing on television instead of publishing in peer review forensics publications or engineering journals? * Why will he not let anyone else have access to his “quantum physics-based” device”? * How can a former police officer with no training or education in engineering or science possibly come up with such a sophisticated device? Danie Krügel is the inventor of the "Matter Orientation System" (MOS), a device which supposedly magically combines DNA and satellite tracking technology to track people across the globe. How this works has never been fully explained, although quantum has been mentioned several times. The MOS or "Bodyfinder" is a contender for James Randi's $1 Million prize, but Krugel has so far refused to come forward and test his invention.